An unusual but utterly delicious jam, with flavors that work surprisingly well together! Sweet almonds, earthy beetroot, and lychee with its light floral taste make for a heavenly combination. This jam is perfect on toast, croissants or on a cheeseboard alongside some hefty French cheeses. Almond and lychee is a classic pairing in the Chinese kitchen and makes for a delicious New Years’ staple. The earthy flavorful beetroot on the other hand also pairs really well with the marzipany taste of the almonds as well as the delicate lychees. So it’s about time the three end up in a ménage à trios. A touch of vanilla makes them all truly come together. Do you know what also perfectly pairs with almonds? Cheese! The subtle sweet taste of almond cookies like cantucchini matches perfectly with rich French cheeses. Add them to a cheeseboard or go one step further and make thin cheese wafers with almond flour for a crunchy delicious appetizer. For more delicious and irresistible flavor combinations check out my new book Flavor Math – A guide to understanding and creating delicious flavor combinations. It is available digitally (PDF) now! Be careful when cooking with beetroot though – they stain like crazy! No wonder they are used as coloring… Wear an apron and clean up beetroot stains as soon as you spot them. A lot of good clothes, kitchen tiles, and cutting boards have been ruined by tasty beetroot. Different jam sugars have different instructions. My calory-reduced jam sugar with stevia called for cooking everything bubbly for 4-5 minutes. If your instructions differ, please follow them! Beetroot, lychee, and almonds get married together in a colorful, mild and delicious jam! Make some tasty tasty jam! Toast the almond slivers in a dry skillet on medium-high heat until they start to brown and you can start to smell them. Drain the beetroot and discard the liquid. Drain the lychees but keep the syrup. Roughly chop the drained lychees and do the same with the beetroot. Put chopped lychees, chopped beetroot, lychee syrup, jam sugar, and vanilla sugar into a pot. Turn the heat to medium-high and keep stirring until your mixture starts to bubble. Let it cook and bubble for 5 minutes and stir occasionally to prevent it from catching at the bottom of your pan. Add the almond slivers and give a good stir. Spoon into sterilized jars till you reach the rim and seal while boiling hot. Place the jars upside down on your counter and let cool! Done! You made delicious jam! 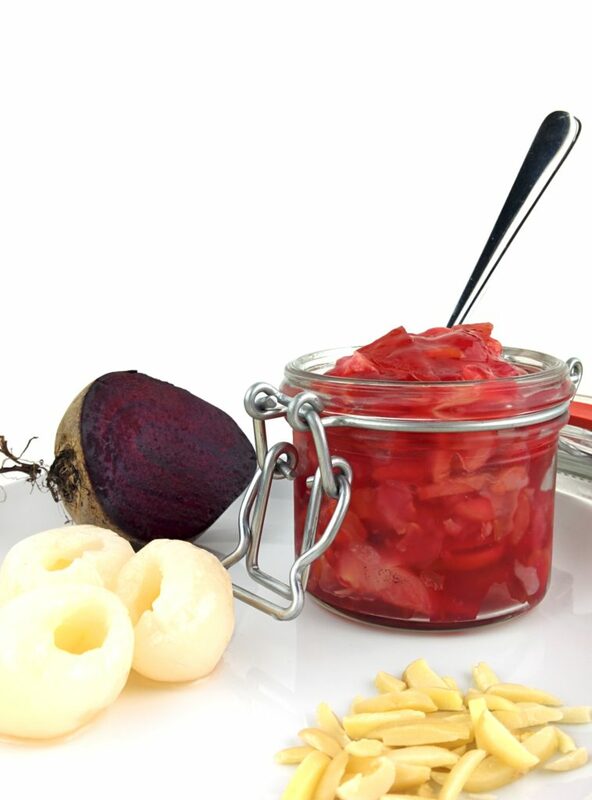 Have you ever had beetroot jam before? What do you think of the combination with almonds and lychee? Share your thoughts and suggestions with us in the comments below! PS: This recipe is inspired by the idea that beetroot shares chemical flavor compounds with litchi and almonds. That’s why they work so well together. Check out James Briscione’s book The Flavor Matrix on food pairing if you are interested in digging deeper into this!